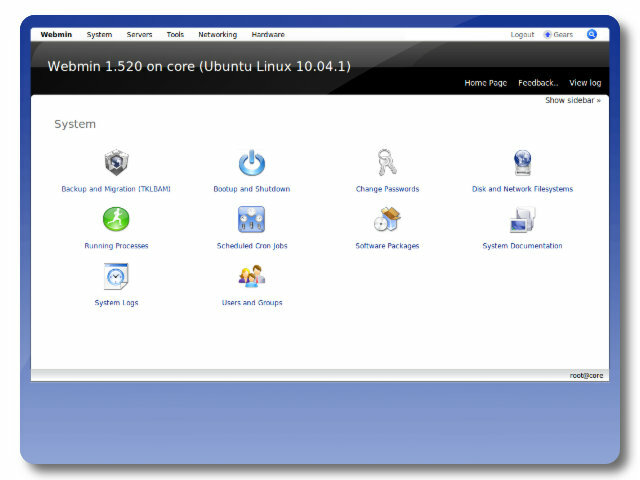 Base Operating System: Debian GNU/Linux 9 (Stretch). Build formats: Deploys on bare metal, virtual machines (e.g., OpenStack, VMWare, VirtualBox, LXC, KVM, Xen) and in the cloud. ISO images: Generic installable Live CD. Installs anywhere. Virtual Machine images: Optimized for virtualized hardware, pre-installed and ready to run. Amazon Machine Image (AMI): Best launched via the TurnKey Hub. Secure and easy to maintain: Auto-updated daily with latest Debian security patches. Optional monitoring and email notification of system alerts. 1-click backup and restore (TKLBAM): smart backup and data migration software saves changes to files, databases and package management to encrypted storage which a system can be automatically restored from. Dynamic DNS (HubDNS): Associates your IP with a custom domain or the free *.tklapp.com domain. Logical Volume Management (LVM): Instead of installing to a fixed size partition, a Logical Volume is first created by default, and this may later be expanded, even across multiple physical devices. AJAX web shell (Web CLI) (shellinabox) - secure command line access from any web browser. Listens on port 12321 (uses SSL). Firewall configuration (with example configuration). Configure time, date and timezone. Shell commands (note not proper interactive shell). Regenerates SSL and SSH cryptographic keys. Installs latest security updates, unless user chooses to defer this for later.